Dina Kantor received her M.F.A from the School of Visual Arts in 2007 and her B.A from the University of Minnesota in 1999. 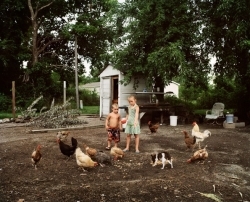 For the past few years, Kantor has been documenting the town of Treece, Kansas. A former mining community, Treece is now economically and environmentally devastated. The residents are in the final stages of a government-funded relocation program, so they can escape living on unstable land that is contaminated with lead. She is sponsored by Blue Earth Alliance for her project in Treece. Kantor received the Aaron Siskind Foundation IPF Grant in 2012, and is a 2013-2014 A.I.R. Gallery Fellow. She has also received grants from the Kansas Humanities Council, the Finnish Cultural Foundation and the Finlandia Foundation National. Her work is included in the permanent collections of The Jewish Museum in New York, the Portland Art Museum and the Southeast Museum of Photography. She teaches photography at the School of Visual Arts, the International Center of Photography, and Adelphi University. Kantor lives in Brooklyn, NY.